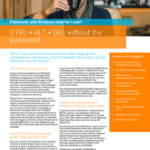 Windows Desktop Logon Agent provides a simple, reliable way to replace the Windows password during the CTRL+ALT+DELETE process when logging onto workstations and servers, without impacting the Windows security model. It can also be use to improve security by adding multi-factor authentication to the Windows desktop logon process. Installation and deployment can be fully automated and the agent continues to work in offline mode when disconnected from the network. Active Directory Group policy provides flexible, centralised management together with the Authlogics Authentication Server.